We have just completed a study of Proverbs at a glance, but the wisdom in Proverbs is never ending. 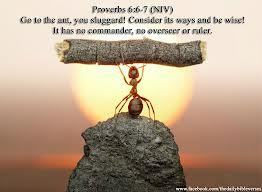 Consider the ways of an ant! Looking down from a great height we must all look like ants, but diligence that an ant has, would be a missing ingredient in the lives of a lot of people. If we are also to read Proverbs 24 verse 33 and 34. We shall see what being a slacker can do. Laziness invites sudden disaster and ruin. Notice from this story the lazy man’s vineyard requires careful and diligent care. It was overgrown with thorns and nettles, and it’s protective wall is broken down. Is this a picture of your life. think about some of the areas in which diligence and responsibility crucial, to your work, your family, your finances, your health and your relationship with Our Lord and Our Friend. What weeds thorns and thistles have we all allowed to grow. What part of the wall of our lives,have we allowed to break down, making us vulnerable to setback and even disaster. God has a sense of humor. Consider the ant. We need to go looking to watch an ant in it’s daily life. We need to go looking through God’s Word to help us be diligent in our daily lives.